Japanese food, simple nigiri sushi and inventive specialty rolls at this Gateway Shopping Plaza restaurant. 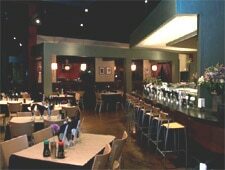 : How could you not immediately warm to a place with a name like The Happy Sumo? It instantly brings to mind benevolent, Buddha-shaped men and bountiful tables of Japanese food. Both fantasies are quickly realized inside the restaurant, though the sumos themselves are confined to two-dimensional wall art. Menu offerings range from simple nigiri sushi to an entire page of wildly inventive specialty rolls to teriyaki and tempura. It's quite fresh and often looks like edible, three-dimensional art. Lunch specials, whether from the sushi bar or the kitchen, are a good bargain.